Friends, I’m trying SO HARD to stay out of politics here on in my professional world, but have you looked outside? It is nutty out there! Whew!! If you know me in real life, you know where I stand, so no need to go further except to say – I love you, family!! That’s right. I look at the community of Real Good Lifers as my family. As I’ve said before, it’s a great honor to be able to serve the super people here in Milwaukee that are too busy doing great things to get dinner on the table on their own. If I can support you in other ways, too, I’m always around. This isn’t just the Maggie Show though. We are all in this together. 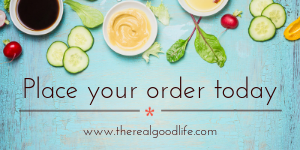 That said, if you check us out on Instagram, Pinterest, or Facebook, you can now find us @TheRealGoodLifeWI. (We’ll be represented as @RealGoodLifeWI on Twitter, but don’t go there. It will only make you feel bad.) Don’t worry, the pictures of my munchkins making messes and me making faces aren’t going anywhere, but I want to make this more about you. Also, and this is the big, exciting buried lede – I am hiring our first official employee! The Real Good Life is growing so fast that I need to add a Kitchen Assistant and Delivery Driver. I am looking for someone who loves food and details with equal passion. This job, which will start at 10 hours per week between Tuesdays and Wednesdays, will consist of assisting in the kitchen with prep work for our delivery menu. Additionally, I’ll be looking for your attention to details when it comes time to package orders and assist with extra entrepreneurial tasks. Finally, I’ll need you on Wednesday afternoons to help with the actual deliveries around the metro Milwaukee area. The full job description can be found here. If you have any questions, please feel free to contact me directly.